The western film has been around since the golden age of cinema; however, in the 1980s and 1990s, the western genre was almost nonexistent aside from Young Guns, Unforgiven, and a little film called Tombstone starring an amazing ensemble cast of Kurt Russell, Val Kilmer, Sam Elliott, Bill Paxton, Powers Boothe, Michael Biehn, Charlton Heston, Jason Priestley, Jon Tenney, and Stephen Lang. Tombstone tells the continuing story of Wyatt Earp after his successful cleaning up of Dodge City. Wyatt Earp moves to Tombstone, Arizona, and wishes to get rich in obscurity. He meets his brothers there, as well as his old friend Doc Holiday. A band of outlaws that call themselves, The Cowboys, are causing problems in the region with various acts of random violence, and inevitably come into confrontation with Holiday and the Earps, which lead to a shoot-out at the OK Corral. The casting of Tombstone is top-notch with everyone on top of their game, and I dare say, the best performance Val Kilmar has put on film. Each character is fully fleshed out, and their motives are extremely believable. The directing of Tombstone is also top-notch, with great sweeping action moments, and at the same time, there are great close-up shots for the dramatic ones. While George P. Cosmatos (Rambo: Firtst Blood Part 2) is credited with directing Tombstone, there has been much controversy in recent years that actor Kurt Russell, himself, actually directed the film while George P. Cosmatos' name was just added to appease the studio. As expected with a great action film, the audio quality is amazing; it provides a digital soundtrack that allows you to feel every horse gallop on your home theater. However, the video quality of the film prevents Tombstone from becoming a "demo disc" for your system. While using the latest AVC codec, Tombstone's video suffers from too much grain on the picture and very dull colors. Hopefully, this will be corrected if a director cut of the film is ever released. In my opinion, with all the westerns created over the years, Tombstone is an amazing film -- the best western film ever made. If there was ever a reason to start watching a film in the genera, then Tombstone is the one to start with. 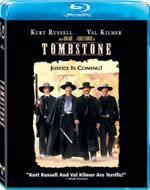 Download Tombstone from the iTunes Store in Digial HD. For more information about Tombstone visit the FlickDirect Movie Database. Nathan Rose is chief executive officer and is in charge of overseeing day-to-day operations. In addition to overseeing operations of FlickDirect, Nathan has also appeared in various online productions and films. Read more reviews and content by Nathan M Rose.